Animals have feelings and deserve proper treatment. This statement was 1 of 40 about animal welfare that Jean Parrella asked study participants to agree or disagree with. For her study on how people’s views on animal welfare affect their buying practices, the senior from Davis, California, set up focus groups with organizations ranging from the Student Idaho Cattle Association to Local Herbivores, a Moscow-area vegan and vegetarian group. “The goal is to get as many perspectives as possible,” said Parrella, 23, who is majoring in public relations in the College of Letters, Arts and Social Sciences and minoring in agricultural extension education in the College of Agricultural and Life Sciences. Parrella grew up on a 3-acre farm with sheep, goats, chickens and horses. After transferring from Sacramento City College to the University of Idaho as a junior, she found herself drawn to how the public views agriculture and how those views impact the industry. Jean Parrella setting up her questionnaire. In her research, Parrella presents each focus group participant with a chart containing 40 statements regarding animal welfare and meat-buying habits. Participants then mark which statements represent their views, and which do not. Afterward, Parrella conducts exit interviews in order for participants to explain the reasoning behind their views. Parrella spent two months reading hundreds of scholarly articles, containing a cross section of perspectives on agriculture, to develop the 40 statements. “I’ve grown up around agriculture, so I thought I knew about animals and animal welfare, but reading all these articles and learning about how people perceive the industry has been interesting,” Parrella said. Once she has finished collecting responses, Parrella will quantify which statements most resonate with people. In addition, she will analyze the qualitative information from the exit interviews to learn why particular statements resonate more than others. Parrella graduated in May 2018. She said doing research as an undergraduate made her competitive when she applied to graduate school. “Pursuing graduate school, it’s all about research, and it was a really good idea to have experience prior to going,” Parrella said. In fall 2018, she will be attending Texas A&M University to pursue a master’s degree in agricultural communications and hopes to continue the research she began at U of I. 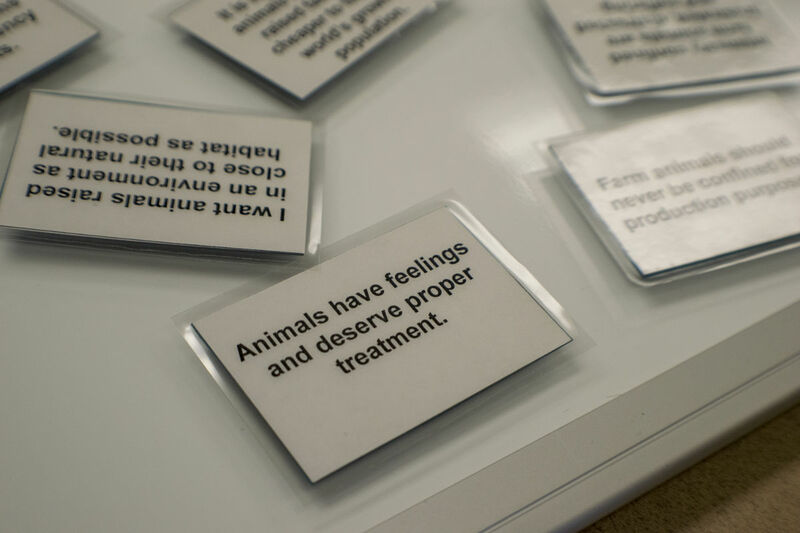 Statement cards regarding people’s animal welfare and meat-buying habits. Jean Parrella is an OUR Undergraduate Research Grant award recipient. Article by Danny Bugingo, a junior from Portland, Oregon, double majoring in math and French. Photos by Madelen Johansson, a senior from Tibro, Sweden, studying interior design.